As doting dog parents, it’s not enough that our dogs can accompany us on airplanes, in stores, and to restaurants, we’ve figured out a way to bring them with us on boats, too! Although most major cruise lines only welcome service animals to board their ships, there are plenty of other options for fun across the seas. So be sure to check out these ports of call on your epic summer road trip! British cruise line Cunard’s Queen Mary II is “the most magnificent ocean liner ever built,” probably because it’s the only one of their ships that is dog friendly! 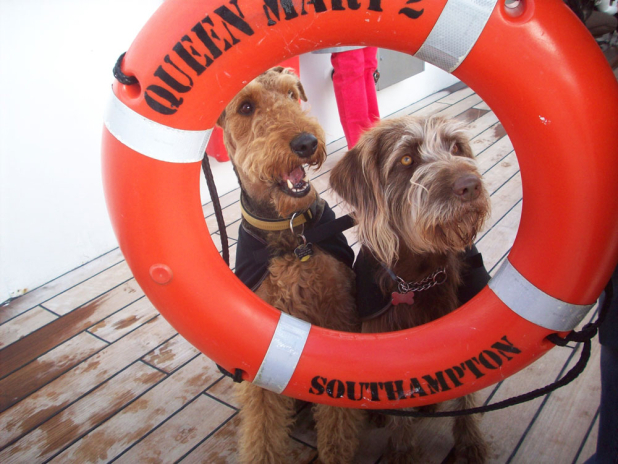 QM2 has a phenomenal kennel program on all trips between New York and Southhampton (south coast of England). The pups are closely monitored around the clock by a kennel master who walks and feeds them. Visiting hours throughout the day let you check up on your pup and spend plenty of play time together! Next trip: Find and book a cruise online! For 65 years now, Seattle’s Argosy Cruises has stuck to their Christmas Ship Festival tradition, the largest holiday floating parade in the world. Last year, they added a very special ship to their caravan. 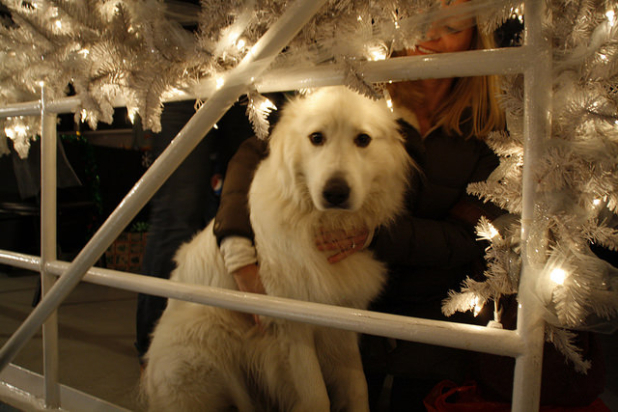 The Goodtime II joined the fun as the first dog-friendly addition to the holiday tradition (rhyme totally intended). Pups and their humans enjoyed champagne toasts, doggie hors d’oeuvres provided by The Dining Dog Café, and pictures with Santa Paws! Citydog Magazine hosts an annual Summer Muttmixer with Argosy Cruises, like a booze cruise for pups (without the booze). The scenic cruise takes passengers to Blake Island, a Seattle state park with 400 acres of uninhabited dog-friendly beaches and trails. Dog Day on Elliott Bay then treats its furry passengers to a healthy box lunch of turkey, veggies, and treats provided by The Dining Dog Café. Humans are not to worry, they’re just as pampered, too; the lunch menu includes grilled pork ribs, Kobe burgers, a famous potato salad, and more. The Potomac Riverboat Company in Alexandria, Virginia has an hour-long sightseeing tour of Alexandria’s Seaport. Last Halloween they made things a little more interesting with a “Bark or Treat” Halloween canine cruise, where humans got a laugh out of a bunch of pups in hilarious costumes. San Diego’s Hornblower Cruises are a local favorite, and it’s not just because of their stuff-your-face-friendly dining cruises. The special edition Bow Wow Brunch Cruise includes all the amenities of the human Brunch Cruise plus an additional doggie buffet! With a 2 hour ride along the San Diego Bay, bottomless drinks and coffee (for hoomans), and an all-you-can-eat gourmet brunch buffet (for hoomans & pups), the Bow Wow Cruise is the most longed-for Sunday Funday of the year! 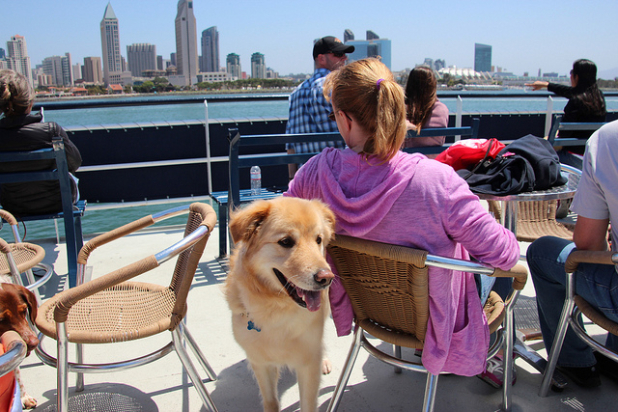 Hornblower Cruises & Events hosted its 14th annual Pet Day on the Bay this year. The fun-filled cruise benefits the Helen Hoodward Animal Center, a local nonprofit that cares for injured and orphaned animals. The hour-long trip, sponsored by Petco, featured expert dog trainers sharing helpful handling tips, a doggie treat bar filled with tempting and mouthwatering treats, and lots of socialization! Are you and your pup book worms? Do you love learning about stuff? 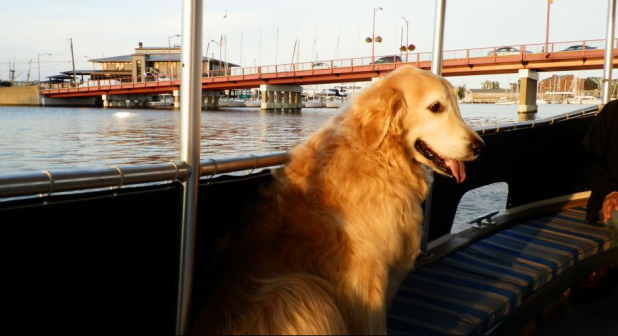 Then the Mercury Skyline Canine Cruise is the cruise for you. On the Skyline Queen, you and your pup can enjoy a ride alongside the beautiful Chicago skyline as a cruise narrator highlights the city’s dog-friendly places and elaborates on the history of Chicago (you can translate to doggie-speak as you go). St. Augustine, Florida is a sight to see, so they’ve got scenic cruises to help you get around without the hassle of asking for directions. While we’re on the topic, all the scenic cruises are dog friendly! This ship has been cruising since the early 1900’s, you can be sure they’ll show you the most picturesque parts of town. The best part is that you don’t have to leave your pup behind! Well-behaved dogs are welcome to board on a leash. Cruises on the Bay in Maryland consist of two sightseeing boat tours in Annapolis and Baltimore. Both cruises are dog-friendly and dogs ride free! Both city’s cruises are educational, providing a narrative to accompany the beautiful sights, and they’ve even got a full bar! (for humans). Let your pup choose if he’d rather cruise for 45 or 90 minutes, and make sure to take plenty of snacks for the road, or in this case, water. Next trip: Year-round! Check the 2015 calendar here. Captain Rory is as much a dog lover as any of us, that’s why her ship the Moondance II welcomes furry friends aboard. The intimate excursions allow up to six hooman passengers and their sea-loving pups. They offer sunrise/sunset trips, shrimp sails, half days, full days, and even whale watching! The sunset cruises are their most romantic. You can cuddle up with your pup and enjoy the beautiful bay and calming waters. Next trip: Whenever you wish! Book a trip here. 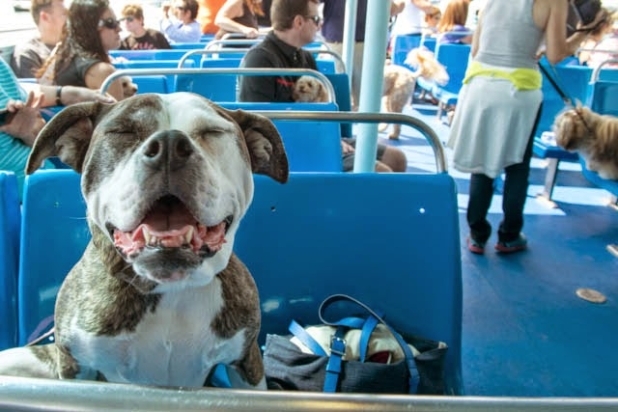 All of Hy-line’s island-bound ferries welcome pets for free! These cruises are perfect for those who want to share spectacular view of Massachussetts’ Cape Cod and its several islands. Next trip: It’s up to you! Book a trip here. Why Do Dogs Give Us Side-Eye (AKA Whale Eye)? If Dogs Have No Sense Of Time, How Do They Know When It's Their Birthday? Does Your Dog Know When You're Naked?